Ever wake up and instinctively know that the day is going to be filled with sunshine and roses? Welcome to my world. Of course, it helped that I woke up with my nose buried in my husband's smelly armpits for the first time in weeks and my dog snuggled firmly at my back side. So in lieu of a real post, I am just offering up my simple thanks for all of you who stumbled upon me, offered your support, your friendship and your advice. And let's not forget those of you who sink to my level and leave me dirty comments. You are folks after my own heart. Anything to get some color into the ole mother-in-law's cheeks. She can be awful pale sometimes. And I am all about public service. 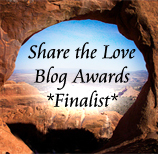 Because I am a shameless hussy (at least that's what my darling Boo kept telling me in the wee small hours of the night), I'd like to remind all of you that today is the last day to vote for the nominees in the Share the Love Blog Awards, for which we all know I am up for the Most Inspirational blog award. So if you find yourself at odds around the bloggy sphere and feel like checking out some great blogs (some greater than others...hello...inspirational...heehee), go on over and give it a click. And a big bloggy hug to all of you who somewhat delusionally voted for me. I love ya. Even if you are quackers.